Joseph Harris Ridges was born 27 April 1827 at Eling, Hampshire, England. He was the son of Edward Bear Ridges and Rebecca Watson Ridges. Joseph was the youngest child of the family of six children. There were three boys and three girls. When Joseph was a young boy the family moved to London where his father labored as a wheelwright. The children were taught a trade as most boys were in those times in England. Joseph trained to be a carpenter and cabinetmaker. Joseph had a natural love for music and musical instruments. Near his home was an organ factory. Any time he could find a spare minute he went to the factory to watch the men at work on these fine instru­ments. He tried hard not to bother or make a nuisance of himself so they would let him watch them. Deep in his heart grew a desire to be able sometime to build an organ that would create beautiful music. He attended the church services of the London Church of England and was thrilled by the lovely music played there. One of the men workers took a special liking to Joseph and carefully explained the intricate steps of the organ building. Joseph listened carefully and watched closely the details of putting the organs together. In later years he said, “I seemed to absorb, like a human sponge, all that I saw and heard.” Others, in speaking of him later, said that the Lord was at that time preparing him for his important future work that was so important to the music of the Latter-day Saints. Joseph was not content to attend only one of the many churches about him, but went to many different build­ings for the purpose of studying the organs and hearing the fine music. He told of one night he stayed at the chapel all night, allowing himself to be locked in the building by the custodian that he might examine more closely the workings of the organ. He didn’t mention what the keeper said on finding him there in the morn­ing. Joseph took music lessons that he might be able to play the organ himself. When Joseph was about twenty-two years old, he married a fine young lady named Adelade Whitley, whose parents were well-to-do people. They were married at New Road Chapel, London. Their first child, Alfred Joseph, was born 13 July 1850. Joseph worked as a cabinet worker in London. Here in his work he met a man, Luke Syphus, who told him of the need of mechanics in Australia. There was quite a gold rush in Australia at the time. The two men decided to go and work where they would make more money. It was with regret that Adelade left her family and friends to go to this far country and make the long ocean voyage. As they bade their families good-bye, they fully expected to return in a few years to their homeland and be with their parents and loved ones again. The Syphus family and they started the journey in November of 1851. They sailed around the Cape of Good Hope, South Africa. Joseph had a sister who had married a sea captain and they stopped to visit her, but found that she had died. They remained two days with the husband, Captain Caithness, and rested and visited his sister’s grave. They still had a long journey ahead as it took them five months to reach Sydney Australia. They were all very seasick on the ocean trip. One little son almost died. Joseph and his wife became very close friends of the Luke Syphus family. They had no idea that their fellow travelers were Mormons. After their arrival, they lived in the same house for sometime and became ac­quainted. The Syphus couple told them of their reli­gion. They had admired them for their good habits and kindly ways, so were interested in further investigation of the Church teachings. The Mormon Elders later taught them more of the Gospel. Joseph and Adelade were baptized into the Church and had their baby blessed. Their second child was born that 29th of November 1851. They called him Anthony Augustus. This child died when 3 years old. While here, Joseph and Syphus worked as cabinetmakers and carpenters for the miners. They also tried to get a little gold for themselves but were not very successful at that. Soon Joseph moved back to Sydney, which he says was a very beautiful city. He said he had a little money coming to him so, as they lived in a two story house, he equipped a room for a cabinet shop and here he began a work he had long yearned to do — to build an organ, which was the first organ to be built in Austra­lia. Joseph had to do most of this work at night as he must go to his regular work in the day to make a living for his family. When it was completed, people were enthralled by its lovely music and stopped to listen as they passed on the street. Among those who came to see the organ was a Mor­mon Elder who was presiding over the Australian missionaries at that time. He asked if Brother Ridges would not make the Church a gift of the organ. He consented, and they prepared to ship it to America. They packed it in cases and covered the cases in tin to preserve it on the journey. The cases had to be as long as the wagon to contain this organ. Joseph’s wife, Adelade, must now have felt a loneli­ness and longing to see her dear family again in England, but they felt that they should go on to Zion. Before they left for America, one of their little sons died. They could not stand to think of leaving his body in this far country, so Joseph made a fine casket, which he sealed tightly, and they placed him in the wagon with them and the organ that was crated to go to the ship to embark for America. Now Adelade had another little boy born on the 15th of April 1856, and they left on their journey the 25th of May for another long ocean journey on the schooner, Jenny Lind. Adelade said they had a pleasant journey. There were several Elders who traveled home with them. They reached San Bernardino in early September and went to the home of a Brother Matthews. Adelade says, “My baby got sick there and died September 15, 1856. Joseph made another casket and sealed it as they wanted to bring these two little dead ones to Salt Lake to bury them. But it proved that they could not keep their bodies, so they were forced to bury them at San Bernardino. They felt very bad, but Adelade said that was not as bad as though they had to leave them in Australia. They fenced the little grave lot with pickets before they left them. Brother Amasa Lyman and Charles C. Rich met the Ridges when they landed at San Pedro with teams, and these wagons were to transfer the organ to Salt Lake City. They went as far as San Bernardino with them. Then Joseph knew he would have to work to buy equipment to go on to Salt Lake. Joseph went into Los Angeles with his family and worked as a carpenter until the next spring. It was very hard work, Joseph said. He had to cut through three-foot adobe walls to put in window and doorframes of this building on which he was working. He earned a wagon and harness and four young mules and a sack or two of flour and a little money. The trip to Salt Lake City was a very trying one in the heat and dust and lack of water over the desert. Joseph could not handle the young mules, as they were not broken to drive, and others of the company he was with had to wait on him along the way. Finally some of the men offered to trade their old mules for his young ones, which he did. Then he didn’t fare much better. They were stubborn and balky and they were deter­mined to go off the road. They went off on a side road and became lost from the others. It seemed that Joseph was not as good a mule driver as he was an artisan. Now he was so discouraged he just stopped and said he gave up trying to go. He thought the Indians would come and kill them. He had heard stories of the Wild West and of the troubles with Indians. Coming from England and Australia, he had no experience with such conditions. The others of the company, when they found that Joseph and his family were not following along, went to hunt them. They knew that Joseph would be afraid, so, with a bit of mischief in their heads, they decided to give him a scare for a joke. They came upon them with loud Indian war whoops. The family was, of course, frightened until they discovered that it was their companions. Then they all had a laugh. Their friends helped get them going back on the right track, and they proceeded on. Some place along their way, they discovered that Joseph had lost his fine gold watch. He felt sad to lose it, but knew it would do no good to try and go back to find it. Luckily, several months later after they reached the Salt Lake Valley, an honest man found the watch and turned it in to someone in Salt Lake and it finally came back to Joseph. They arrived at Salt Lake on the 11th of June 1857. That night the news came of the murder and sad death of Parley P. Pratt. Adelade little thought then that one of Parley Pratt’s widows and also a daughter would later be taken as polygamous wives to her husband. Adelade said that she had been in many beautiful cities, but she thought Salt Lake was a lovely place and differ­ent than anything she had seen. She and her husband walked about that first evening after supper to look at this new place. They had come from so far to live and dwell with the Saints. They admired the wide streets and the fresh clear mountain water, the beautiful gardens and orchards that grew so fine, though the Saints had been in the Valley only ten years. 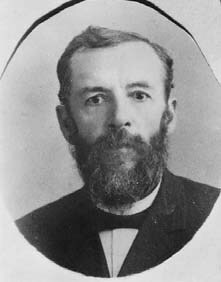 President Farnham, who was the head of the mission in Australia and the man who baptized them, took them to his home for a few days until they could rent a house. They lived later on Brigham Street. Their arrival in Salt Lake came in the year of Johnson’s Army trouble. Joseph Ridges was called, with the other men, to go out to protect their homes and families against this army. While he was away, a little baby girl was born. They named her Adelade. Later, when President Brigham Young told the people to move to the south, Joseph took his family and went to live at Spanish Fork. Though he was not a farmer, he must make a living some way for his family, so he farmed. While they were here another son was born. They named him Alma. He died when eight years old. After they were back in Salt Lake, they had two more children — Ernest Edward and Elizabeth May. Now Adelade found that her husband did not disap­prove of polygamy as he thought he would when in Australia. He married a girl named Emma Smith in Salt Lake in 1858, just a year after he got to Zion. She was four years older than he. Emma had only one child, called Mary. Later he married Agatha Walker Pratt, wife of the late Parley P. Pratt. They had two children — Wilford, a son, and a daughter who died. Wilford was the first Bishop in Ogden 9th Ward when it was organized, and there have been five bishops from his family. Joseph married Agatha Pratt, a daughter of Parley P. Pratt, in 1866. She was just eighteen at this time, and it was a trial to his older wives to go through all the strain of poverty and travel and share their husband with this almost child. Agatha bore him eight children. Agatha was my husband, Charles E. Dean’s, mother’s mother. Their oldest daughter named Florence married Joseph H. Dean. 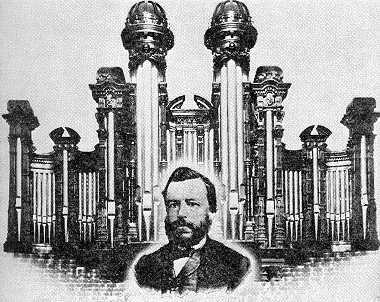 Upon their arrival in Salt Lake City with Charles C. Rich’s Company, they unpacked the organ, and it was installed in the old adobe tabernacle in the corner of Temple Square. Presidents Young, Kimball and Wells, and Elders Amasa Lyman and George A. Smith stopped in on the Sabbath to hear Joseph Ridges and Orson Pratt, Jr. play upon the organ they had brought from Australia. They were much gratified, and said it was a valuable acquisition to the Church Choir. This organ was used for several years before the new tabernacle and organ were built. When the large new tabernacle was built, Brigham Young came to Joseph Ridges and asked if he thought it would be possible for him to construct a large organ for the great building for the Saints. When Joseph said he thought it could be done, Brigham told him to proceed with the plans and get men to help him right away. There was careful planning for such an adventure. He worked for days drawing plans that would satisfy himself and the leaders. Brother Truman 0. Angell would come in and look over the plans and agreed that they were satisfactory. President Young was pleased, and directed Joseph to go ahead with the building of this organ. Many men were called to assist in the work. They searched about to find the finest timber, which must be long and straight and free from knots and pitch. Finally they selected logs that grew in Pine Valley and about Parowan Mountains. That was 300 miles away to the south of Salt Lake City. The hauling was done by wagons with ox teams. When the logs reached Salt Lake they must be carefully cleaned and the inside was burned out and scraped to make a perfect pipe for the organ. They set up a workshop in one corner of the temple grounds. On the outside of the wall, they boiled hundreds of cow and buffalo hides to make the glue to fasten securely the different parts. It sent up a very terrible odor all around. Joseph set about this work prayerfully and with happiness and pride that at last his life ambition of making a really fine organ was to be accomplished. The work was started in the early 1860s and it was a slow process. Many of the materials could not be obtained in Utah. Joseph left others doing the work of preparing the pipes and framework while he went east to Boston to procure materials, such as brass, fine wire, and ivory for the keys. They wanted the best to go into this organ. It was stated that the Lord had been preparing Brother Ridges for this work from his youth up to that time, for that was the greatest thing that he had always desired to do from his boyhood. 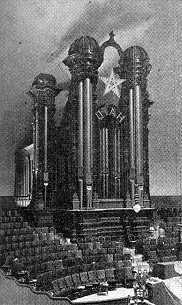 All the people of the Church looked forward to the day when the organ would be completed. Brigham Young said, “I am waiting patiently for the organ to be finished. Then we can sing the Gospel into the hearts of the people.” Even Brigham Young, with his great vision, could not know at that time just how much this organ and the great Mormon Choir would do in spreading the gospel to many lands, as it has gone out over radio and television. Years after the completion of the organ, Joseph Ridges said, “I am proud of that organ, as proud as the proud­est father could be of a distinguished son. I have the satisfaction of knowing that, when I am laid to rest, that organ will stand as a memorial of the trials and the difficulties that were overcome by the pioneers. It will breathe out sweet music to delight future generations.” We know that the organ has been added to and im­proved upon, but for the original organ, as great as any in the world at the time, it was a great contribution to our Church. Several testimonials were held in Joseph’s honor in later years in honor of this work. Also, Joseph was the builder of one of the fine staircases that leads to one of the Salt Lake Temple sealing rooms, as well as much fine work on buildings in Salt Lake. In March 1936, a picture of Brother Ridges was hung in the Utah State Capital by the Daughters of Utah Pioneers, in recognition of his contribution to the State. Joseph Ridges was a High Priest in the old 17th Ward of Salt Lake City. He lived to be 87 years old. He treasured the memory of the days of the organ building and always loved to talk of this accomplishment and remembered the thrill he received as he first heard the music coming from this great organ that he had the privilege of building for the advancement of the music of the Church. Joseph died the 7th of March 1914 after a short illness. His last wife, Agatha, died just five months later.